Standing at the center of the Quwwatul Mosque the Iron Pillar is one of Delhi’s most curious structures. Dating back to 4th century A.D., the pillar bears an inscription which states that it was erected as a flagstaff in honour of the Hindu god, Vishnu, and in the memory of the Gupta King Chandragupta II (375-413). How the pillar moved to its present location remains a mystery. The pillar also highlights ancient India’s achievements in metallurgy. The pillar is made of 98 per cent wrought iron and has stood 1,600 years without rusting or decomposing. Take the case of the Brahmi inscription alone. Readings of this six-line, three-stanza inscription in Sanskrit verse vary considerably, the one most often published being that by Fleet, who translated it in 1888. 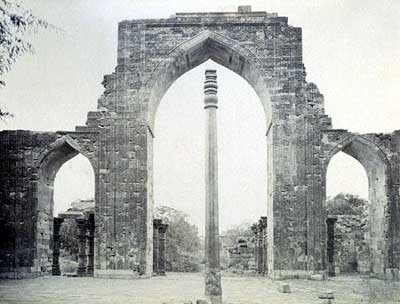 On other grounds, historical or paleographic, it can be concluded that the pillar belongs to the Gupta period, but, from among the imperial Guptas, who is it that is referred to here simply by the name of ‘Chandra’: Chandragupta I, Chandragupta II, also celebrated as Vikramaditya, or, as some firmly believe, Samudragupta? Again, the Guptas were known to have been devotees of Lord Vishnu, but where was this hill called ‘Vishnupada’ located? In a report published in the journal Current Science, R. Balasubramaniam of the IIT Kanpur explains how the pillar’s resistance to corrosion is due to a passive protective film at the iron-rust interface. The presence of second-phase particles (slag and unreduced iron oxides) in the microstructure of the iron, that of high amounts of phosphorus in the metal, and the alternate wetting and drying existing under atmospheric conditions are the three main factors in the three-stage formation of that protective passive film. Many theories have been put forward from time to time to explain the rust-free state of the pillar. 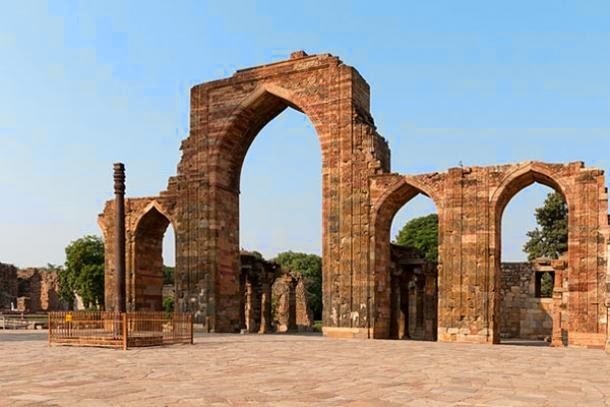 For example, the site of the pillar is away from industrial areas and the climate of Delhi is fairly dry. It is known that serious corrosion of iron does not take place if critical value of relative humidity is less than 80%. At Delhi, the relative humidity exceeds 80% for only about 20 days in a year and exceeds 70% for only about 65 days in a year. Therefore, although the total rainfall annually is about 15-30 inches the atmosphere in Delhi is not very conducive to rusting of iron. Besides a dry environment, there appears to be no doubt that the protective scale on the pillar has played a major role in protecting this monument. There are two major theories of formation of this protective scale. It is quite possible that both the factors have played equally important roles in formation of this scale.